Image caption Mr Kim appeared in front of reporters on Friday apologising for conducting "espionage"
A US citizen detained in North Korea says he stole military secrets to aid South Korea, during a press conference organised by Pyongyang. Kim Dong Chul, 62, made the apparent confession on Friday, apologising for spying and bowing to reporters. Mr Kim has previously told journalists he is a naturalised US citizen, born in South Korea, and that he was arrested in October for "espionage". 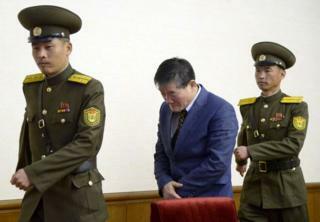 Forced public confessions by foreign prisoners are common in North Korea. Mr Kim said that he was first approached by South Korean intelligence officers in 2011 to engage in paid espionage, North Korean news agency KCNA said. He was arrested while receiving a USB stick containing military and nuclear secrets from a source, KCNA said. According to Chinese state news agency Xinhua, Mr Kim said he was first introduced to South Korean spies by US intelligence officers. "You could say that my anti-North Korean behaviour was also instigated by the United States," he was quoted as saying. South Korea's National Intelligence Service told AP news agency Mr Kim's case was not related to the organisation, without providing further details. In January, Mr Kim said in an interview with CNN in the presence of North Korean guards, that he made frequent trips to the North Korean special economic zone of Rason, where he was caught. He said he had not worked for the US during any of his spying activities and that he used to live in Fairfax, Virginia. His interview came weeks after North Korea jailed US student Otto Frederick Warmbier for attempting to steal a propaganda sign. The US has previously accused North Korea of using its citizens as pawns in a diplomatic game. Pyongyang denies the accusations. Otto Frederick Warmbier, a US student who was sentenced to 15 years of hard labour in March 2016 for trying to steal a propaganda sign from a hotel and "crimes against the state"
Hyeon Soo Lim, a Canadian Christian pastor of South Korean origin, was sentenced to a life term of hard labour in December, also for "crimes against the state". Sandra Suh, an American aid worker, was arrested then expelled in April 2015, accused of gathering and producing anti-North propaganda. Matthew Todd Miller was sentenced to six years' hard labour in September 2014 for what North Korean state media described as "hostile acts", but was released in November the same year. Kenneth Bae was arrested in November 2012 and accused of using his tourism business to form groups to overthrow the government. Sentenced to 15 years' hard labour in May 2013 but was released along with Mr Miller. Jeffrey Fowle, held for five months and charged with "anti-state" crimes, was released in October 2014. Korean War veteran Merrill Newman, held in October 2013 on charges of "hostile acts", was released in December the same year. North Korea nuclear: What now after H-bomb test claim?